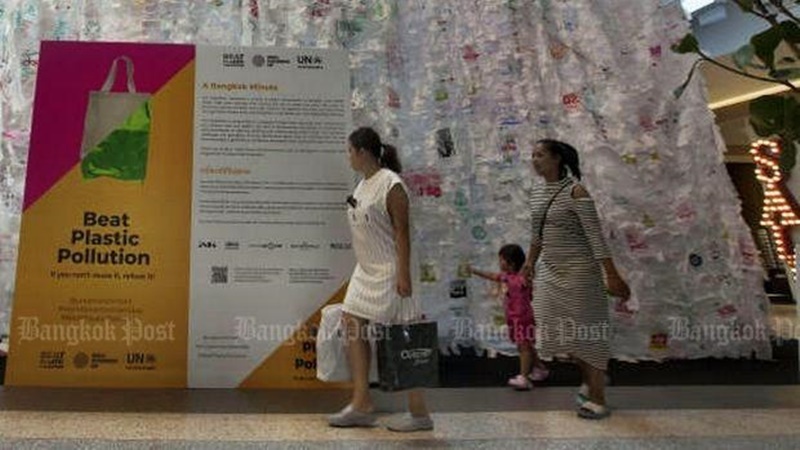 BANGKOK: The Ministry of Natural Resources and Environment and 11 other ministries yesterday (June 5) expressed interest in reducing the use of plastic bags and polystyrene foam in their offices at an event marking World Environment Day. This year the day was running under the theme of “Beat Plastic Pollution”. Some 800 participants attended the event in Bangkok, which was organised by the Department of Environmental Quality. Wijarn Simachaya, permanent secretary of the Ministry of Natural Resources and Environment, said government offices should serve as role models for businesses and the public by leading by example and creating public awareness of how changing patterns of behaviour and consumption can easily lessen our reliance on plastics. This follows a cabinet resolution dated Jan 23 that ordered several ministries including his and the Interior Ministry, as well as a number of other agencies, to launch a campaign to reduce the use of plastics in both the public and private sector. Plastics are seen as posing a threat because such waste does not degrade easily and harms the environment both on land and at sea – as highlighted in recent days by the case of a pilot whale that washed up in a Thai canal in the far South and was found to have ingested 80 black plastic bags, considered a major contributing factor in its death. According to Gen Surasak Kanjanarat, the minister of natural resources, measures are urgently needed to reduce the amount of plastic bags Thai people use and announced that the ministry will order the Department of National Parks, Wildlife and Plant Conservation and the Zoological Park Organisation to ban plastic bag use in all 154 national parks and at state-owned zoos countrywide. The ministry will meet with officials from the Bangkok Metropolitan Administration and discuss ways of reducing the use of plastic bags at fresh markets, he said. It will also talk with the Ministry of Finance to see how business operators can cash in by developing more eco-friendly alternatives for use at local markets, he added. The ministry hosts an event to mark World Environment Day every June 5. This day was established by the United Nations Environment Programme (Unep) 45 years ago and it has adopted a different, or at least rotating, theme each year. An estimated 500 billion plastic bags are used globally each year. Thais use eight each a day or 8.7 in Bangkok, figures show. Thailand creates 27 million tons of garbage per year, 43% of which is properly managed. Around 13mn tons seeps into the sea. Pawin Talerngsri, a member of the national reform committee on natural resources and the environment, said more legal measures are needed to reduce plastic waste. He called for a law ordering department stores to charge their customers for plastic bags, as is the case in Taiwan and Europe. Within five years separating garbage at home in the interests of recycling will be a legal requirement, he added.